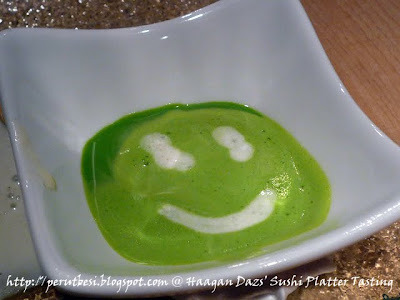 Overall comment: So good that you'll clean the whole dish! 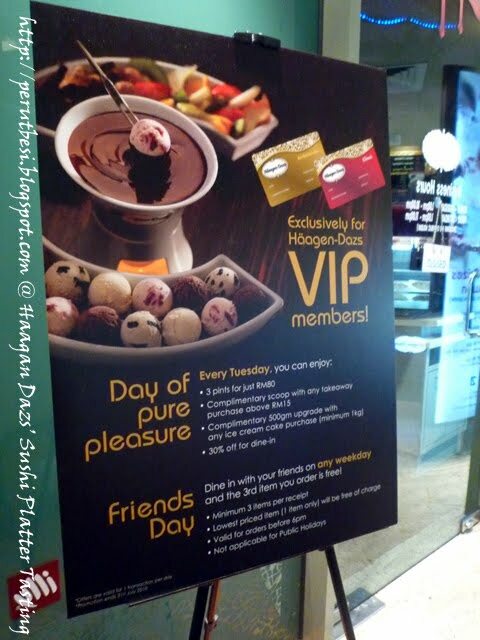 Thank you, Häagen-Dazs & Pat-Lin Communications Sdn. Bhd. for the unforgettable experience last week! 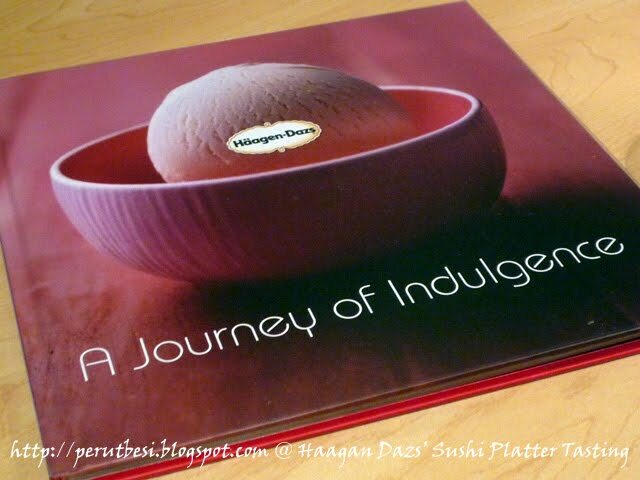 My mum & I were 'high' on ice-cream & it was a lovely time trying out the new Sushi Platter, seeing my mum being so satisfied with her ice-cream, meeting up with other foodies, as well as getting to know the friendly people from Häagen-Dazs & Pat-Lin! Oh goodness, that's a long list of lovely memories! 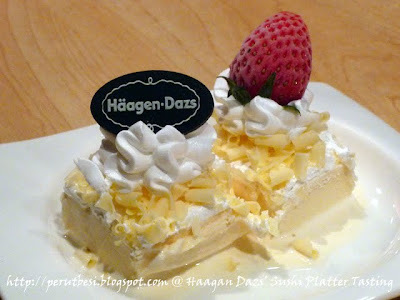 Regina & Joelle from Pat-Lin were really friendly, & so were Kenny & his colleague from Häagen-Dazs! 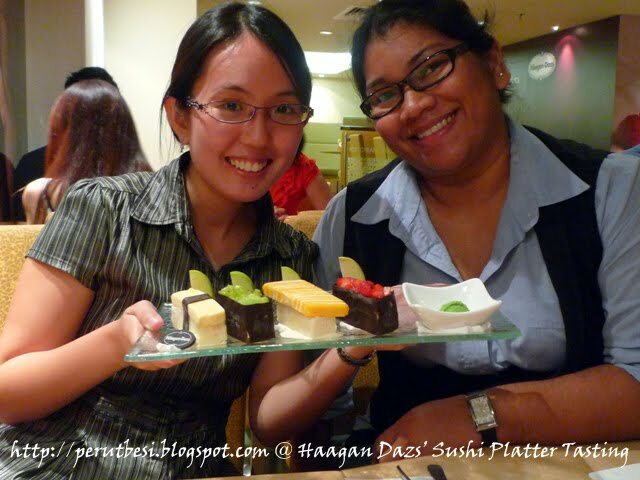 Meeting the other foodies like Babe in the City - KL, Joe, Bangsar-Babe, Foodelicious, & the rest of the foodies whom I didn't get to say hi to, was just awesome! You can read their reviews in the links I have provided. Check it out! Nice, right? 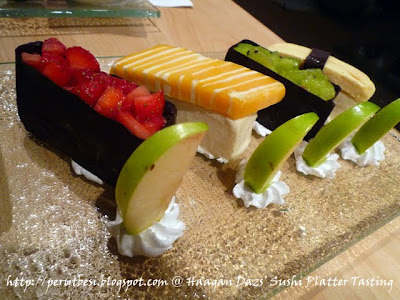 Doesn't it look like the actual sushi?? I thought it was really amazing art! I didn't want to put them into my mouth cos they were just too pretty a sight to behold! I just wanted to say "hello!" to them! I was told by the Brand Manager of Häagen-Dazs, Kenny Tan & Regina from Pat-Lin Communications that there will only be 5-6 sets for sale per outlet per day, so if you really want to get a taste of this, you better be quick or make a reservation for your dream ice cream! 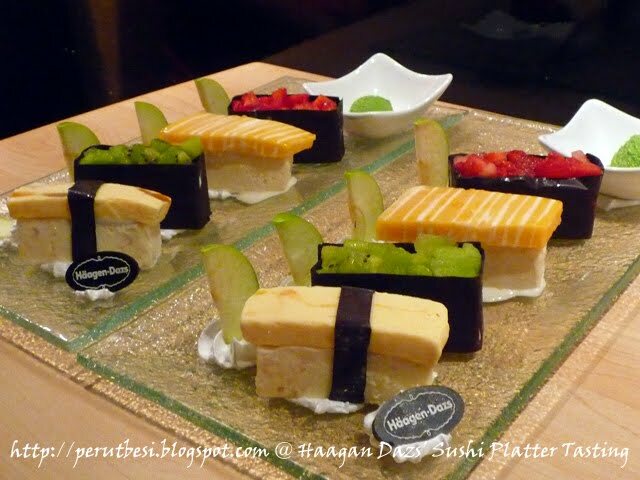 Mango & Passion Fruit Sushi, Strawberry Gunkan, Mango Sorbet Sushi and Kiwi Gunkan, and the platter of 'sushi' is accompanied by refreshing green tea ice cream ('wasabi'). 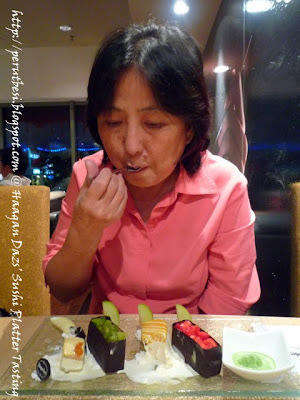 Mum's ready to dig in! So, what makes the 'sushi' look SO appealing & colorful? Mango & Passion Fruit Sushi (Tamago/Egg Sushi) – Refreshing Mango & Passion Fruit ice cream placed on top of Macadamia Nut ice cream and delicately held together by a chocolate strip. 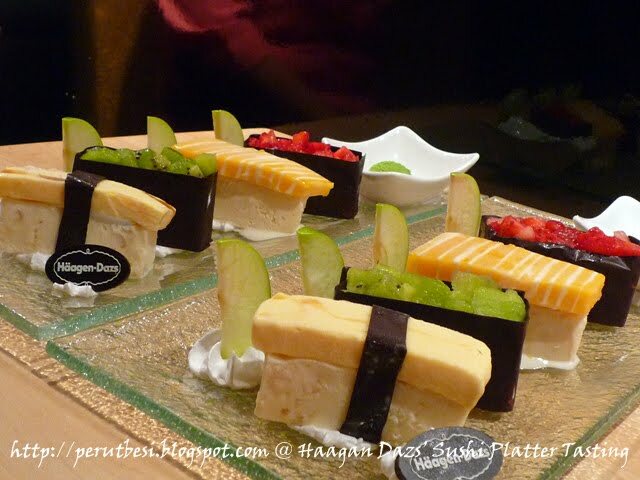 Strawberry Gunkan (Baby Octopus Sushi) – Rich Macadamia Nut ice cream encased in a rich chocolate wrapping topped with fresh strawberries; a juicy combination to tease your taste buds. 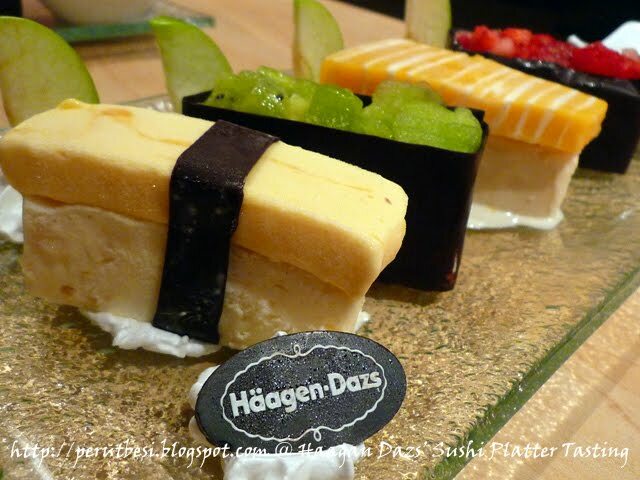 Kiwi Gunkan (Seaweed Sushi) – Classic Vanilla ice cream in a rich chocolate wrapping topped with fresh Kiwi fruit is a blend of tangy fruits and silky smooth ice cream. Thanks for the lovely chat & friendly hospitality! 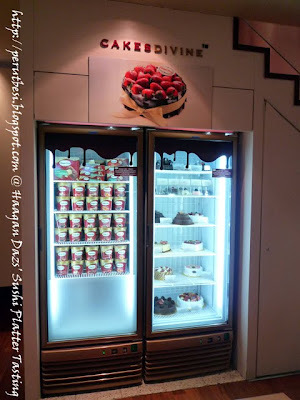 By the time I took so many photos of it & posed with it, the ice cream was crying to be eaten! 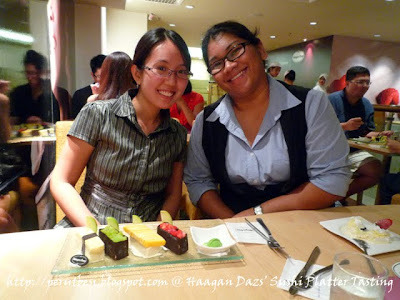 Hahaha...can you see my Salmon Sushi 'crying'? :D Thank goodness Häagen-Dazs' ice cream doesn't melt very quickly! 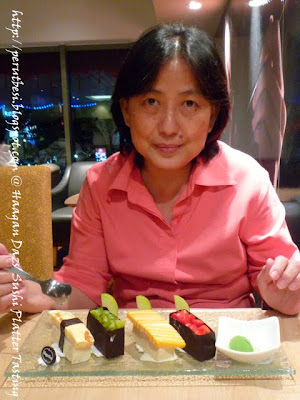 Oh, mum is SO enjoying... early Happy Birthday! The verdict? PerutBesi is VERY HAPPY! 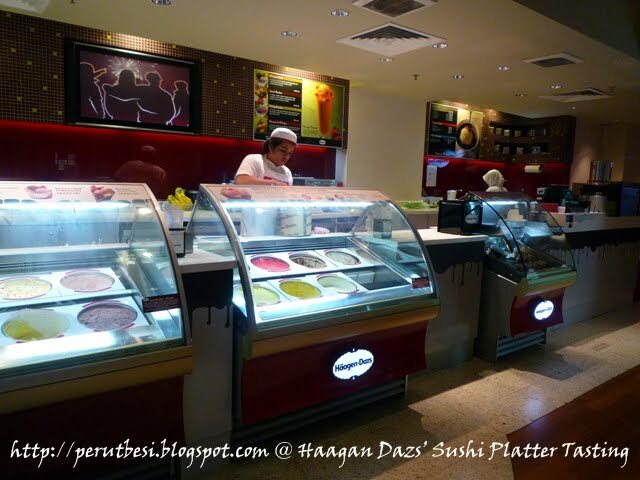 Ice cream & ice cream cakes are also sold at Häagen-Dazs. Best shared with loved ones! Hi! Glad you enjoyed it! And it was nice meeting you and your mom! nice to see you again but too bad we have to sit so far apart! ->babe_kl: PShan! Ya lor...the place where u sat was packed d & my mum was with me, so I didn't go over. If I'm alone, I may join u all since I know some of u d...But it was good on the whole :) got to spend some good time with mum & she was in 7-heaven...she loves ice cream & having this was a dream come true for her :) looking forward to meet u sometime soon!!! Cheap Roast Pork Belly & Lamb Shank?